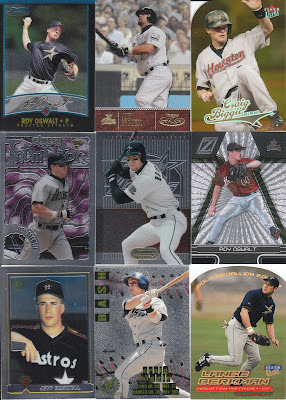 The Daily Dimwit: Monday Mail Day!!! Got a few packages in the mail today! First up, we have a package from Nomo's Sushi Platter... 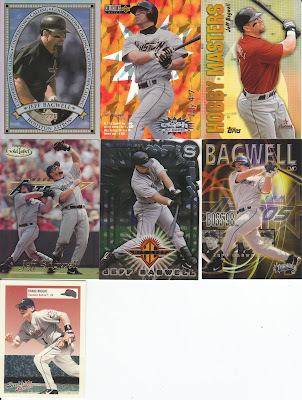 I am holding some cards for him and he went ahead and sent his part of the trade. Your part will go out with the group break cards Michael! Thanks! 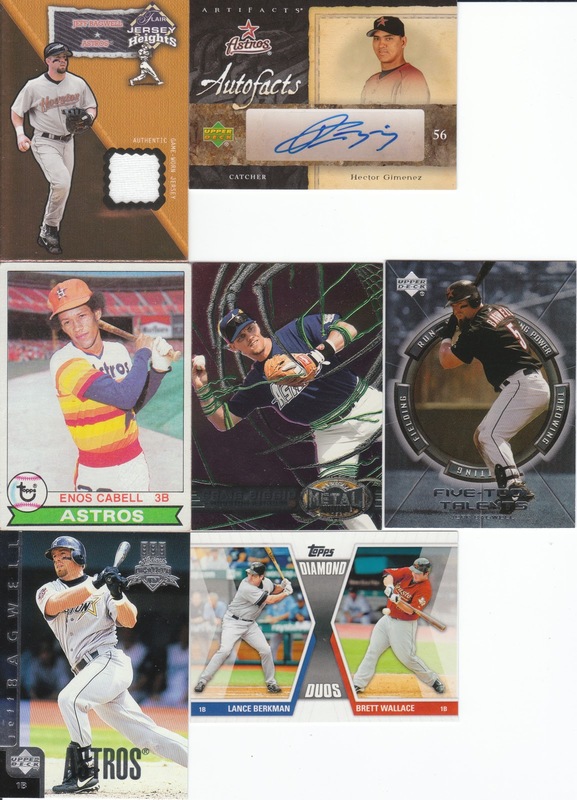 A nice Bagwell jersey and Hector Gimenez auto... that's the third Gimenez auto I've gotten in the mail the past 2 weeks... too bad he didn't pan out! 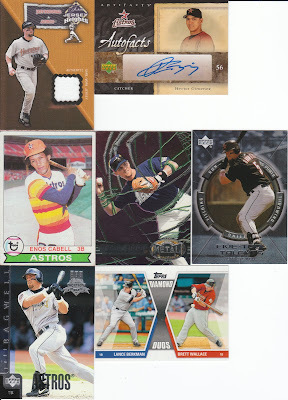 Next up, a package from The Diamond King! He mistakenly sent a package to my old address, a month later it made it's way here, he felt bad and sent a "I'm sorry" package. Well, this good deed will not go unpunished! You're getting a "You had nothing to be sorry about!" package headed your way soon... meanwhile, he packed it full of AWESOME cards! These are just the highlights folks! Lots of shiny!!!!! 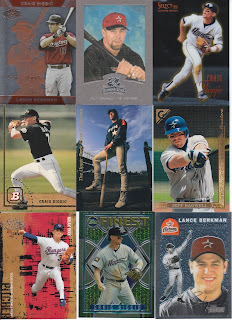 Awesome die cuts of Biggio and Berkman! I love seeing all that reflective silver!!!! More shiny stuff!!! See that last card, seem a bit small and odd? Well it folds out, see below! Biggio on the outside, Bagwell on the inside! A perfect card!!! I really hope they both get elected to the HOF on Wednesday. They deserve to go in together! 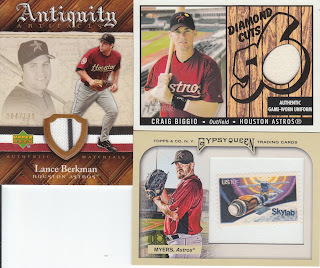 Awesome Bagwell jersey relic to wrap it all up! More shiny!!!! Almost all of the cards he sent were numbered! Great stuff Dustin, you're awesome! 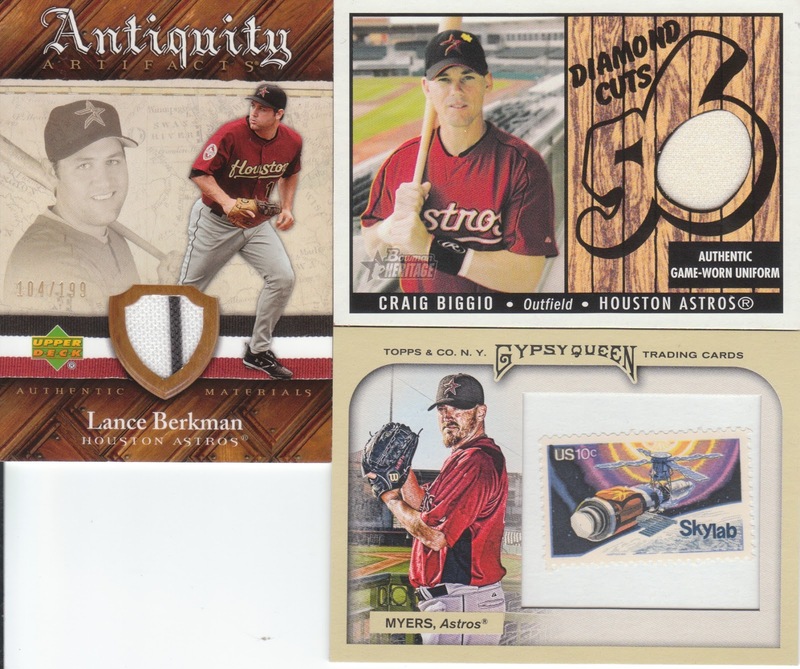 Awesome Berkman, great Biggio relic and a 2011 GYPSY QUEEN STAMP CARD #2/10!!!! WOO HOO!!! My affinity for 2011 GQ is well known at this point. 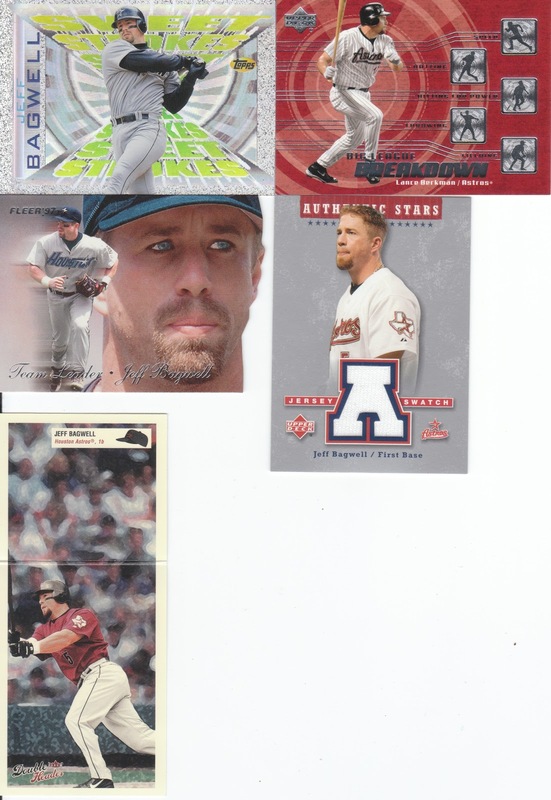 This is my second Stamp Card, as I previously picked up the Hunter Pence stamp in a trade as well. 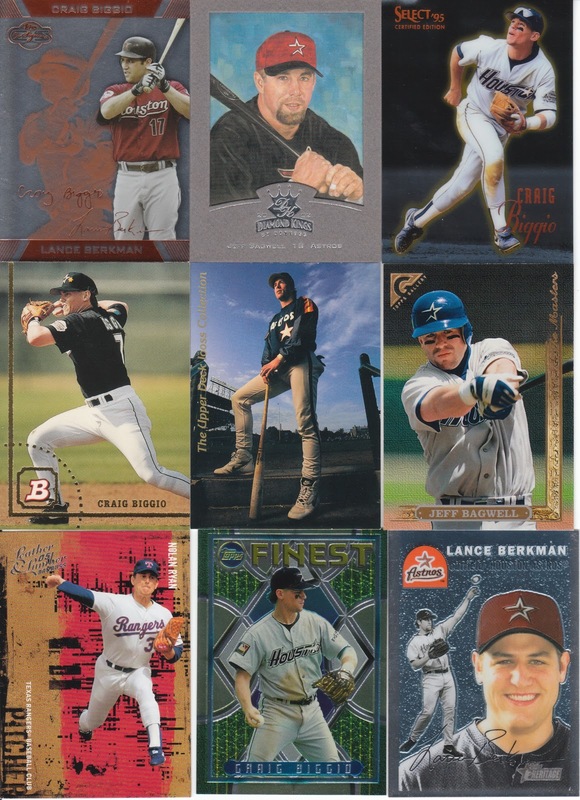 Would love to get all the Astros but at this point I don't think it's going to happen! People put an unnecessarily high price on them on eBay. But this one is AWESOME! Great Skylab stamp and a cool Spring Training pic of Myers. Thanks Dustin!!!! I can't post without a note of sadness regarding Richard McWilliam. I know he has been vilified in the past few years, but I think many should thank him for revolutionizing card collecting in the 90's, when it started to go stale. He introduced many of the things we love today: relics, autos in product and even redemptions. In my mind he's an innovator and should be appreciated as much for the good as he is vilified for the bad. The hobby takes a hit with the loss of an industry leader. Hopefully Upper Deck can rise from the ashes a bit and get back on solid ground. RIP Richard McWilliam. Glad you enjoyed everything, man. I just got mine today. Great trade! I am happy that you enjoy what I sent you. No rush on a return package. Thanks. Glad you got them this time! !